LAUSANNE, Switzerland -- The World Baseball Softball Confederation today launched the first-ever world rankings for softball, across both men's and women's disciplines. 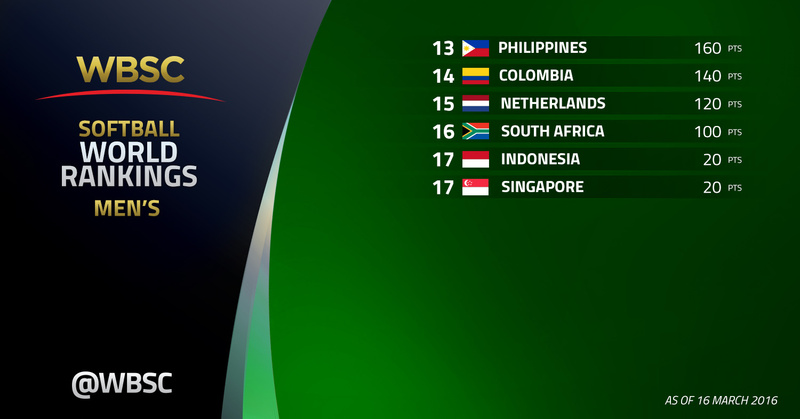 The newly implemented world ranking system tracks the performance of a country's National Team in the Softball World Championships, including junior and top-tier levels, over a three-year period. The WBSC Softball Competitions Commission carried out the assignment of extensively reviewing, developing and introducing an initial world ranking system. This task force will continue to study the best method for the ongoing expansion of the world rankings to include multi-sport events, regional championships, head-to-heads and other WBSC-recognised international competitions in which WBSC's 141 Members worldwide participate. 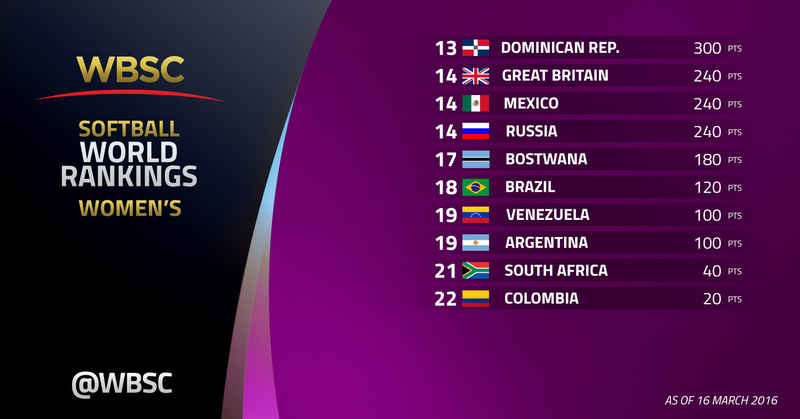 "These new softball world rankings mark another major milestone in the history of our global sport," said WBSC Softball Division President Dale McMann. "These rankings not only provide a benchmarking tool for nations to construct and evaluate their strategic/development plans, but they also give the players and fans a new and exciting way to express the pride of their country through sport." Japan and New Zealand rank No. 1 in the new WBSC Softball World Rankings in women's and men's, respectively. Japan is now the top-ranked country across both women's softball and men's baseball -- events that could potentially be re-introduced and generate massive nationwide interest and strengthen host nation, as well as worldwide, engagement for the Tokyo 2020 Olympic Games. Japan's top ranking and success on the world stage comes as baseball/softball is the country's top sport, in terms of youth participation, popularity, fan-attendance, broadcast/media coverage and existing infrastructure. Europe is represented in the Top 10 by No. 7 Netherlands (880 pts), No. 9 Italy (760 pts) and No. 10 Czech Republic. Junior Ranking based on previous championship Senior Ranking based on the result of two previous championships. The most recent would have a 75% value and previous championship would be 25% value. Full WBSC Press Release available here.